After four weeks of civil unrest, the fall of the Tunisian president Ben Ali played out for all the world on Twitter this Friday, some dubbing it a “Twitter Revolution” like the election protests in Iran and Moldovia. Increasingly, collective events from TV shows to the World Cup to #lessambitiousmovies to the fall of dictatorships cause spikes in related conversation on the microblogging network which, with its broad media influencer adoption, has become the world’s eminent news amplifier. 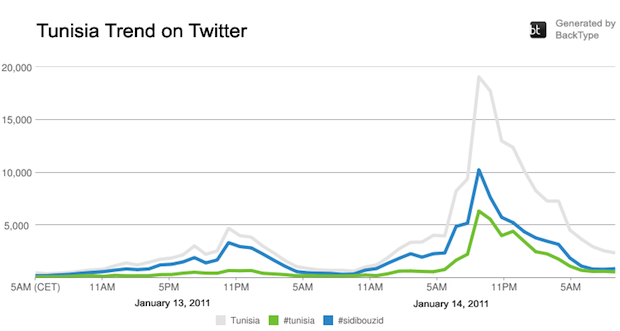 Christopher Golda of Backtype (which does Twitter analysis) provided us with snapshot of Tunisa mentions on Friday January 14th. Not surprisingly the hashtag peaked at 28 tweets per second at 21:27:56 Tunisian time (20:27:56 GMT, 12:27:56 PT), a couple hours after the first reports that Tunisan president had left the country at around 9:30 PT. 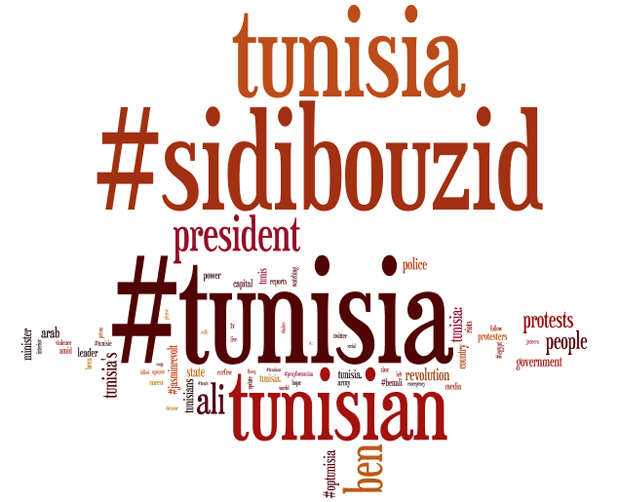 At the end of the cycle, total tweets mentioning Tunisia (including those using the #Tunisia hastag) were over 196K. Total tweets for #sidibouzid (the province where the protests started) were over 103K. It’s interesting to note that only three of the top tweets are from a mainstream media source (only one from the US), four (including @alfarhan’s) are breaking the news of Ben Ali’s departure and two are breaking the news of the dissolution of Parliament. The most retweeted account, @VoiceofTunisa with its 496 followers, was retweeted over 400 times. The fact that Facebook, like Twitter, sees an increase of activity around times of political change and facilitated communication between activists this time around explains its appearance at the top of the leaderboard here. More active international media like the Guardian, the BBC and Al Jazeera round out the top five. The first US-based traditional media source, The New York Times comes after the Liveword.ca blog at number seven. Since we spend so much time on the sites ourselves, there is a tendency for bloggers and reporters to be myopic when it comes to the use of Twitter in mediating significant events. Because news about Tunisia saturated our Twitter streams, it can seem like Twitter played a crucial role in instigating the news itself. And while the jury is still out on just how much tweets can influence something as monumental as the fall of a government, it is worth noting that the critical mass of Tunisia related activity on Twitter happened after Ben Ali fled.